We often think of spare ribs in the summer, thrown on the grill and eaten with corn on the cob or cole slaw. 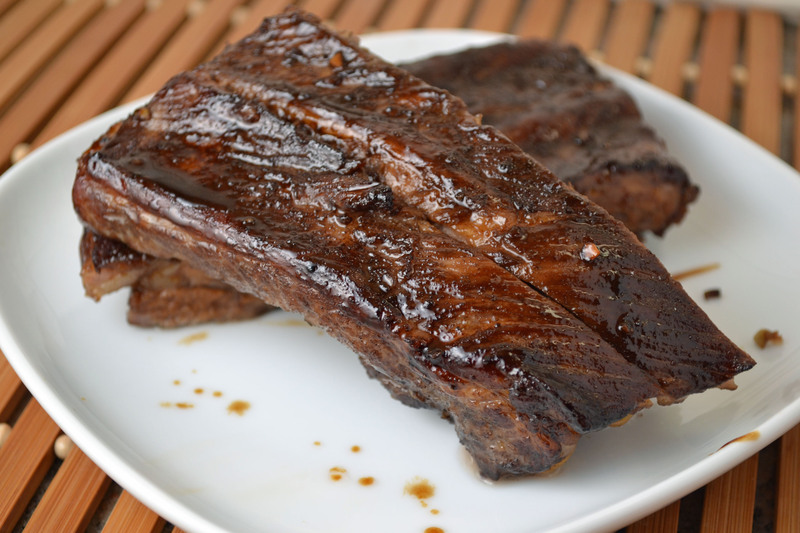 However, Chinese spare ribs have a sweet and salty warmth that make them perfect for the winter. Marinated in a mixture of soy sauce, garlic, rice wine vinegar, and Chinese five spice powder, these ribs are baked in the oven and basted until almost charred but still gooey and tender. There are many different methods for baking ribs. Some recommend boiling the ribs prior to baking to extract some of the fat. In “The Art of Good Cooking,” my grandmother recommends steaming the ribs in tin foil in the oven before baking and basting the ribs. Other methods indicate marinating the ribs and putting them directly in the oven, similar to what I’ve done here. The cut of meat may help determine what method to use. If the ribs are particularly fatty, they will be greasy so either boiling or steaming them will help produce a leaner tasting rib without a fatty residue. Although my grandmother didn’t specialize in Asian food, there are a few recipes hidden throughout her book. Her original Chinese BBQ sauce recipe can be found in the spare ribs section along with Hawaii BBQ sauce and Mexican BBQ sauce. I decided that the Chinese sauce needed a bit more attention so I made a few modifications. To get the full texture and flavor that Chinese spare ribs deserve, I added the Chinese five spice powder and rice wine vinegar to the sauce as well as a step to marinate the ribs. On these crazy winter days, juicy flavorful ribs are worth the extra effort. Mix together all ingredients in a shallow dish and add ribs. Turn to coat. Cover and marinate in the refrigerator for 1 hour. Heat oven to 350 degrees. Place a baking rack on a rimmed baking sheet or roasting pan lined with foil. Remove ribs from marinade and place on rack, meat side up. Reserve marinade. If space permits, pour water half-way up the sides of the pan (make sure the water does not touch the ribs). Bake 30 minutes and baste with reserved marinade. Bake another 30 minutes and raise heat to 450 degrees. Baste the ribs then bake another 20-25 minutes until glazed and tender, basting once after 10 minutes.